I have really enjoyed reading through Initiative One recently. It’s a great little blog that unfortunately seems to have been inactive since September of 2010. Even when it was active, it was not very high volume (38 posts 2008 – 2010), but just about everything is worth reading. 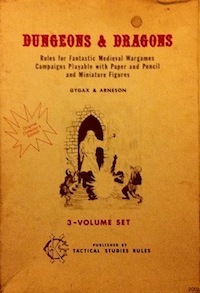 It has a wonderful historical perspective on OD&D; I read it from cover to cover. This entry was posted in Spotlight on October 13, 2011 by Necropraxis. Did you ever make that scraper script? No, I haven’t yet, but I still think it would be useful. Basically, cd into a directory to store the downloaded copy, run ‘python [url-of-oldest-post] [name-of-local-file]’ and this script will merrily copy all of the blog posts into one long, simple HTML file which should be good for making ebooks from. I don’t really know anything about making ebooks, but this is a pretty basic format. Titles and bodies have their own divs, and titles are h3’s. Images are downloaded and stored locally, and re-linked in the file. Fair warning: I hacked this together in about half an hour, it’s not too pretty, and it doesn’t do any exception handling. Only works on Blogger blogs. ebook-convert is part of the Calibre package. Input and output files should be renamed to fit your situation. All the flags after them are optional, but I found them useful.